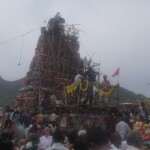 Tiruvoodal is the divine quarrel between Shiva and Parvathi and it is celebrated in Tiruvannamalai during the month of January, the second day after Pongal. 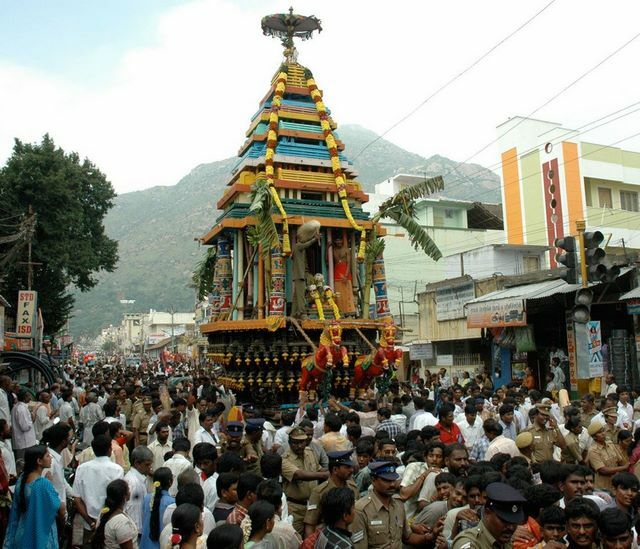 In fact there is a whole street close to the temple called ‘Tiruvoodal street’ where the main part of the festival, the divine quarrel or the Tiruvoodal itself, is enacted. The Divine quarrel revolves around the time when one day Parvathi playfully closes the eyes of her august husband, Lord Shiva, with her hands. Utter chaos ensued. The whole universe was plunged in darkness and what was just a moment of play to Parvathi causes countless years of darkness and misery on the universe. 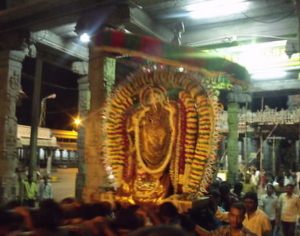 Lord Shiva, enraged by this act of folly, punishes Parvathi which sends Her to Kanchipuram to do Tapas where She receives the assurance that after she kills the buffalo-demon Mahishasura on the slopes of Arunachala, She would subsequently regain the favour of her Lord and be united with Him in the left half of His body (Ardhanaariswara) and this is what is realised on the day of Karthigai Deepam. 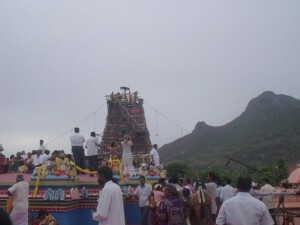 It would seem that the Tiruvoodal festival is celebrated in Tiruvannamalai in order to commemorate the time when Shiva and Parvathi were in discordance. Nevertheless, it finishes with the divine union and brings them both back together in harmony. 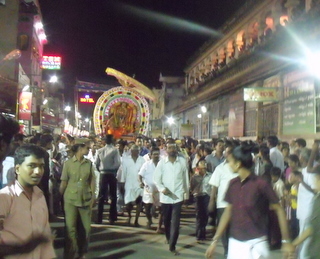 On the first day, there are three processions of the deities starting from the big temple and going on the four streets around the temple. 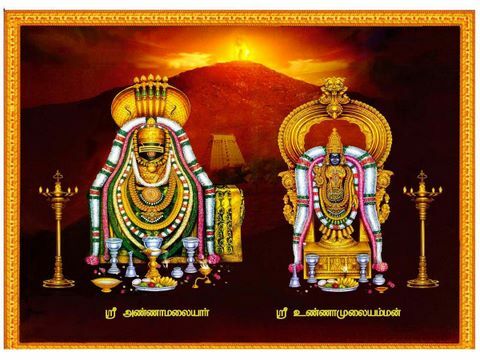 The Utsava Murthis are Sri Mula Nayakar (Shiva in the form of Somaskanda), Tani Ambal (the independent goddess) and Sundaramurthi Nayanar (one of the main tamil saivaite saints). 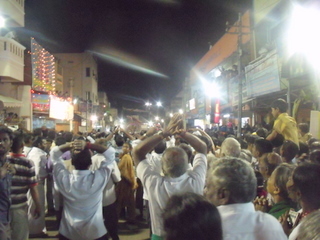 The most interesting part of the festival takes place in the evening on Tiruvoodal street. During this part, the quarrel between Shiva and His consort, Parvathi, is enacted in public on the streets and witnessed by a large gathering of devotees who are assembled there eagerly to watch the divine drama. 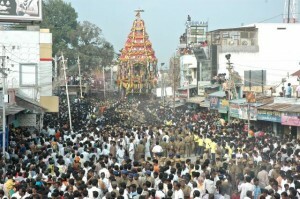 The God and the Goddess are brought on palanquins from opposite ends of the street and then borne down to face each other. 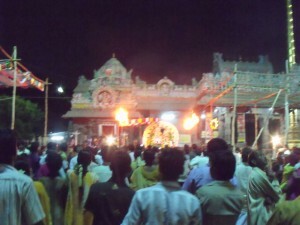 The narrative of the quarrel is chanted by an Oduvar (temple singer) in tamil lyrics. After this ensues a dramatic dancing procession. Six times the God and the Goddess are borne down at a great speed and then meet in the centre and have their quarrel. 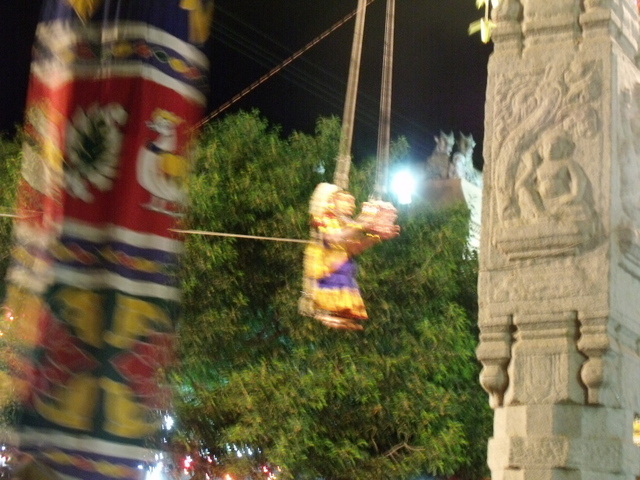 This is played out by the palanquin bearrers jumping and shaking the palanquin up and down, which makes it appear as if the deity inside is jumping up and down in a fit of rage. The temple musicians play their drums in fitting accompaniment, adding to the frenzied rantings of the gods as they are shouting at each other. After each quarrel-dance, the deities change sides and each goes off in the opposite direction from which he or she came initially. The crowds of devotees are hysterical with excitement and after each dance-quarrel, the tension mounts and so do the loud cries of fervor and devotion which increase in volume and fury. 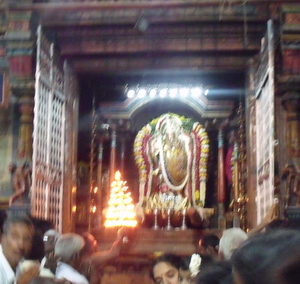 The next day, Shiva is up at dawn and leaves on Giripradakshina during which he makes a halt at the Vedarpari mandapam where his jewels are supposedly stolen and later on he also grants salvation to his ardent devotee Kannappa. 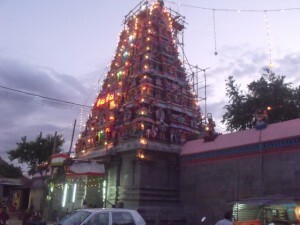 This is the reason for the Kannappa temple on that location. Shiva also grants darshan to another of his devotees the great rishi ‘Bhringi’ during this trip. 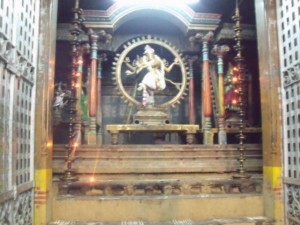 Shiva eventually completes his giri pradakshina and returns to the temple in the afternoon where he enters, dancing the dance of the Swan (Hamsa Natanam). 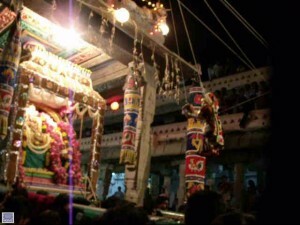 The bearers of the palanquins have a special technique to execute this dance and it causes a type of swaying, continuous oscillation of the deity without losing balance, quite a fascinating sight! 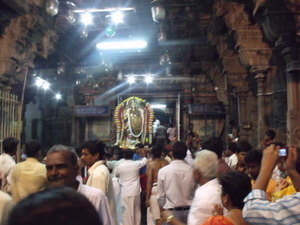 Now a ritual takes place in the southern area of the temple which covers directly the sanctum sanctorum. 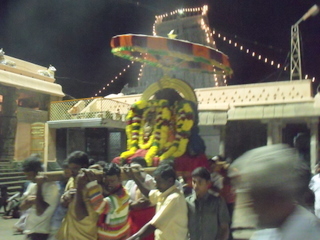 Sundaramurthi Nayanar first goes to warn the Goddess about the return of Shiva. Of course, She, being curious, leaves Her door open so that She can have a glimpse of the dancing arrival of Her Lord. On seeing this spectacle, however, She is so dazzled by her Lord’s beauty and splendour as He arrives majestically doing His swan-dance, that She submits to Him and wishes to be re-united. 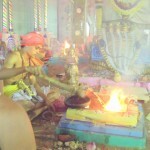 Thus the reconciliation and reunion of the gods take place and to celebrate this, both the deities are brought together and placed on the same pedestal and the priests perform an Arathi puja waving and encircling one single flame around both of the deities to signify the restoration of harmony. 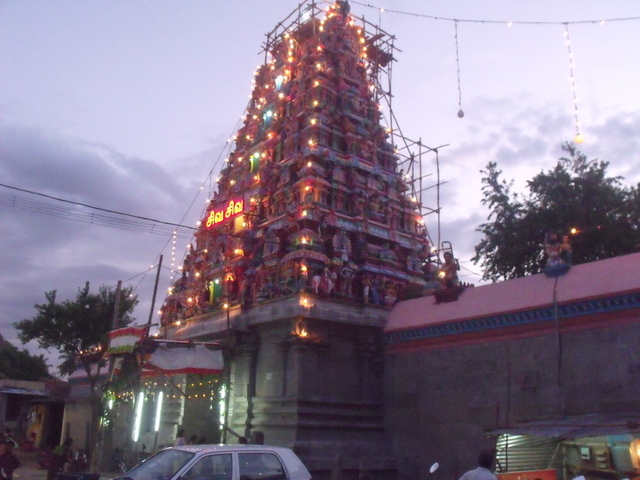 It is the eve of Karthigai Deepam today and Tiruvannamalai is being battered by torrential rains since yesterday. 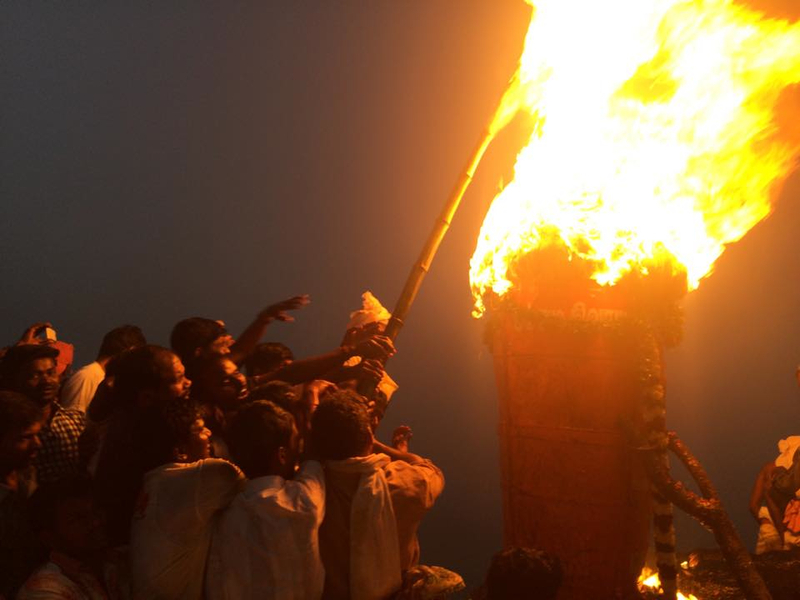 One wonders how the Deepam flame will be lit tomorrow amidst this deluge but Light it they will come rain come sun the devotees of Arunachala have never failed to Light the Holy Beacon of Karthigai since time immemorial! Meanwhile day before yesterday, ie on Wednesday 29 november was the day of the Maha Ratham and once again, we witnessed this awesome event with thrill and wonder! It has been 20 years since the writer settled down in this sacred place and has never ceased to be spellbound by the majestic and impressive festival- journey of this magnificent chariot of the Gods.. 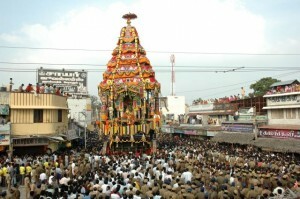 The eight day of the Karthigai festival is the day of the Maha Ratham or the Great Chariot. On this day, the great wooden chariot which is the largest temple chariot in Asia, is taken on procession around the four streets of the temple. 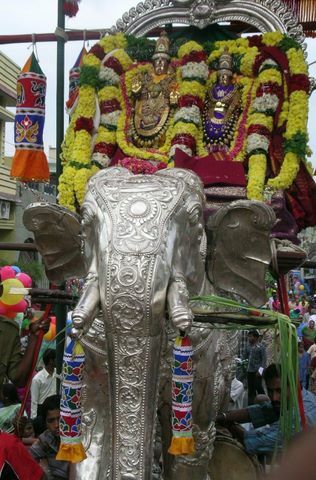 The main great chariot carries the stately figures of Lord Arunachaleswara and his consort Goddess Unnamulai whereas the smaller chariots which follow in retinue carry the deities of Lord Muruga, Lord Ganesha and Goddes Durga respectively. Early in the morning, thousands of men and women flock the venue of departure in front of the Raja Gopuram, eager to pull the chains of the chariot and thus have the honour of drawing their Lord’s vehicle. 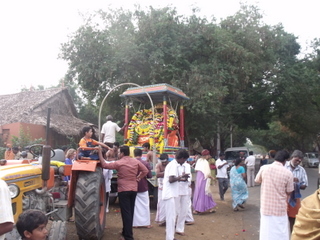 The method in which the chariot is drawn goes back to ancient times. Two long chains made of iron links are connected to the chariot. Carpenters use wooden wedges as brakes to check the speed on the downward slopes as well as to stop the ratham. 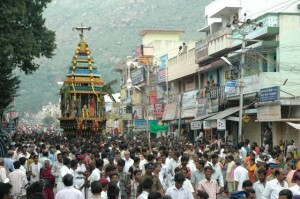 The signal is given to lift the chain and the devotees pick up the chain. The men hold one side of the chain and women the other. When the wedges are removed and the lever is applied at the back of the huge wheel to give the initial momentum, the second signal is given from the chariot. 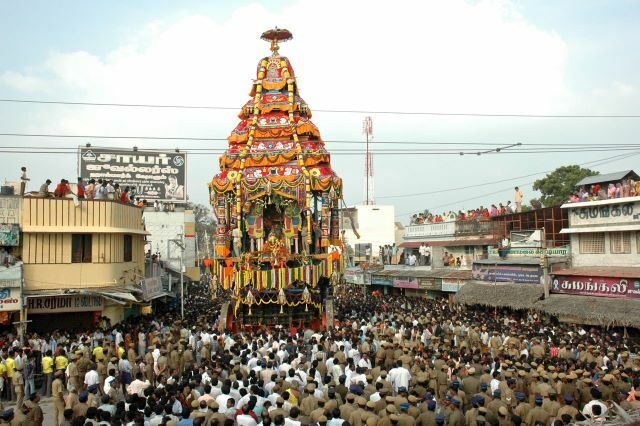 At once, men and women with great enthusiasm and cheering in unison “Hail to Annamalaiyar” draw the chariot with all their might. Slowly, inch by inch, the great chariot moves and as the pull increases, it gains momentum and moves faster. It is indeed impressive to see the gigantesque, enormous wooden chariot move forth slowly and majestically, drawn entirely by man power. 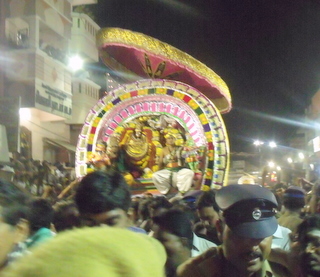 The chariot is made of rose wood and has beautiful carvings of divinities on its sides. 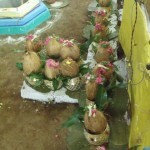 The top is decorated attractively with silk canopies, banana and coconut fronds and flower garlands. 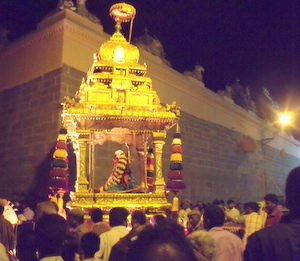 The Temple Sivacharyas in royal attire are seated on either side like footmen to the Gods and they wave lovely peacock feathered fans to keep the Gods cool and refreshed during their procession. 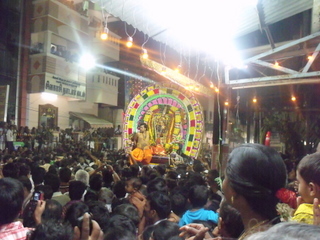 And thus the great chariot winds its way down the temple streets. By the time it has reached the western street, it is evening and the sun has started to set. The golden rays of the sinking sun shine through the peaks of the Hill. With the Hill view, the golden sunset, the soaring temple towers and the Lord majestically riding on his great chariot in the centre, it is indeed a spectacular sight and one feels the presence of the Lord Himself witnessing the scene in quiet enjoyment ! 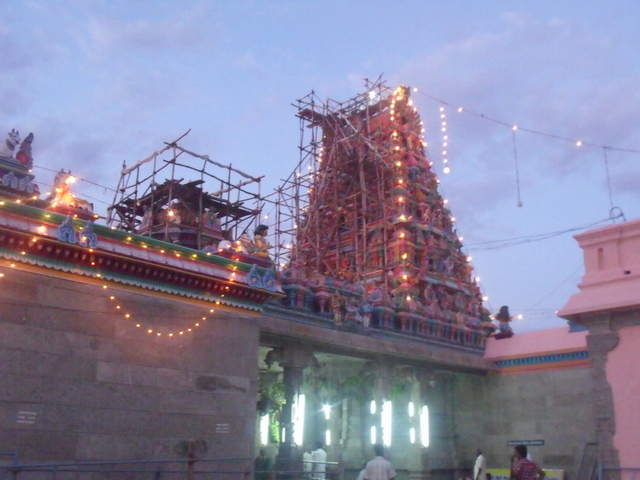 The Mahakumbaabhishekam ceremony was performed for the Adi Annamalai temple after 16 years. The last one was in 1996. 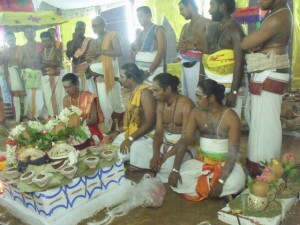 The events leading upto the grand ceremony were begun on Tuesday, 10th July and the actual pouring of the holy waters on the gopurams took place on Sunday, 15th July. 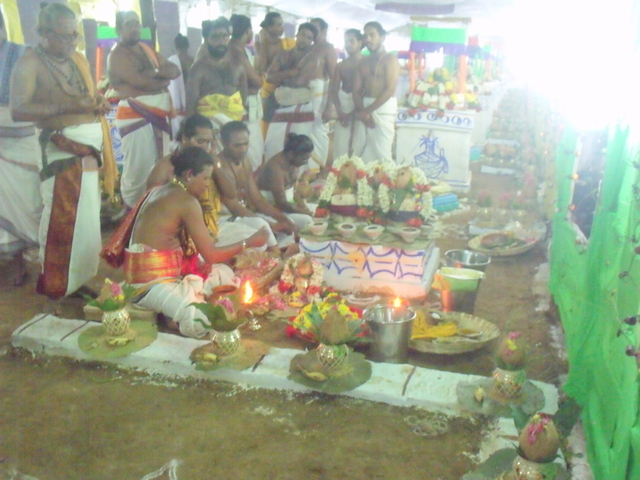 On Thursday, the splendidly decorated yaga salas were inaugurated and 108 sacrificial fires or yagnas were kindled in a spectacular manner during which the waters in thousands of pots or kumbhas were consecrated in preparation for the grand abhishekam. 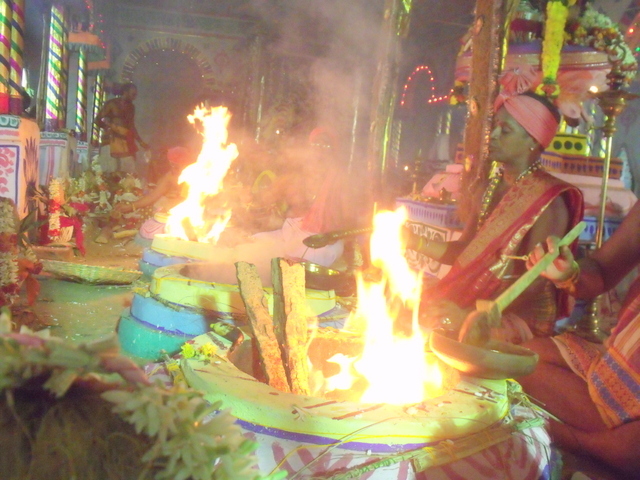 It was indeed an awesome spectacle to witness the crescendo of the vedic chants, the exotic rituals surrounding the fires and the divine energy which seemed to pervade and rise with the passage of each day. More than 300 venerable brahmin priests hailing from the four vedic traditions of Rig, Yajur, Sama and Atharvana took part with great devotion and expertise in all the ceremonies and devotees were treated to a sumptuous feast of religious extravaganza during all the 6 days. 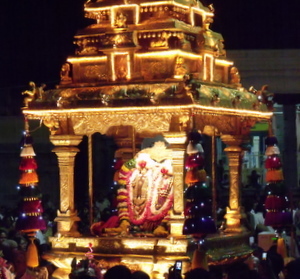 The word Mahakumbaabhishekam literally means ritualistic pouring of sacred water from the great vessel. This type of ritualistic pouring of water dates back to hundreds of years to post-vedic times when temple rituals were formalized. 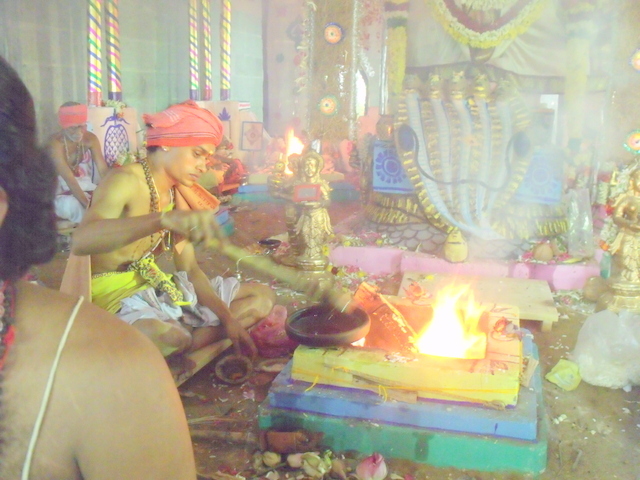 During the vedic period, deities were invoked and propitiated in great rituals of fire sacrifices such as yagnas and homas, which were performed in the open. After this period, when temples were built for different deities, the divine energy/spirit was invoked by appropriate homas and transferred into kumbhas — brass or mud vessels containing the water of the holy rivers of Bharatavarsha — by chanting mantras derived from the Vedas and Samhitas. These mantras consisted of prayers to different deities for the well-being of mankind, guidance in performing religious duties properly, and instruction in following the four-fold duties of Dharma, Artha, Kama and Moksha. 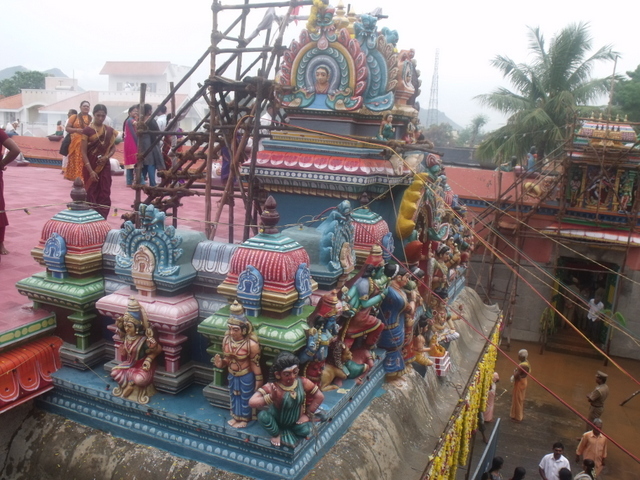 After the vigrahas of the deities were installed, the energy in the water in the kumbhas was transferred to the vigraha in the temple by pouring the water on the gopuram (top of the temple tower) and on the vigraha of the deity. This pouring from the Kumbhas was accompanied by the chanting of appropriate mantras derived from the Vedas, considered to be of divine origin. According to the tenets of Vedanta , the living being is a part of the supreme consciousness which embodies the origin, sustenance and annihilation of the universe as we know it. It is beyond our human ability to comprehend this ultimate reality. The enlightened ones sometimes glimpse the Ultimate through meditation. The ordinary human offers obeisance and worship to the best of his ability to the personification of this supreme being in the form of the deity in the temples. He consecrates the Vigraha sculpted by the best artisan, and installs it in the temple built in the best architectural tradition. Divine energy is endowed on the vigraha by single-minded performance of worship in the best ritualistic tradition. Through the continued performance of worship by numerous people over generations, the divine energy in each vigraha builds up, and the temple as a whole grows in spiritual status. And thus,on Sunday morning, July 15th, millions of devotees thronged the area around the Adi annamalai temple from 4 am. 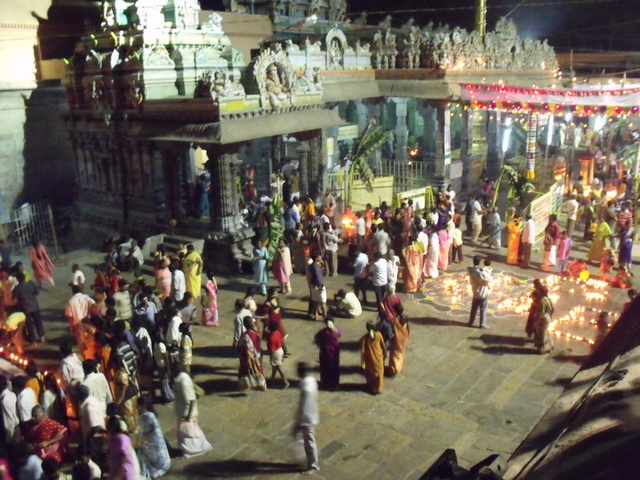 The previous night there had been an utter deluge of rain and people had to wade through oceans of water even inside the temple. The lucky few were admitted to the roof tops of the temple where they waited eagerly for the Kumbhas of holy water to be brought up. 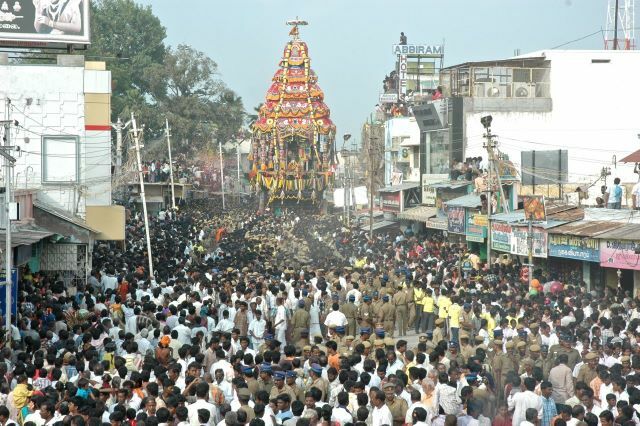 And sure enough around 9 am the pots arrived borne on the heads of brahmin priests to the loud chanting of the Rudrams. 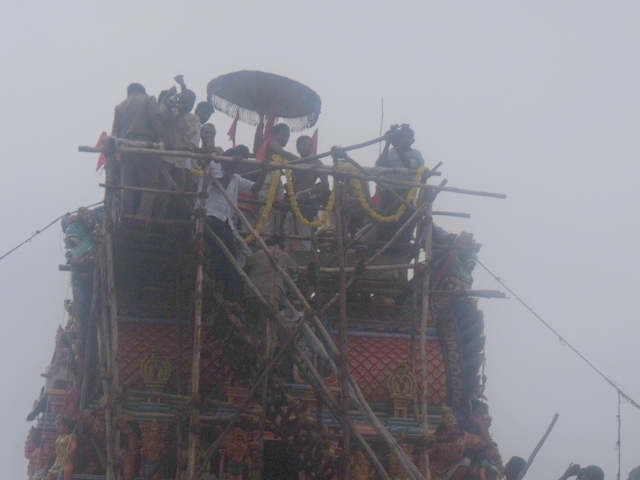 And then they were carried up by the stately Sivacharyas and finally, the waters were poured slowly over the spires of each gopuram hailed by cries of devotional fervour from the crowds below “Annamalaiyarukku haroharaa” ! 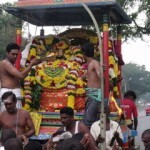 Mid June to mid July is the tamil month of Aani. During this month there takes place the first of the two important festivals dedicated to Lord Nataraja, the Aani Thirumanjanam festival. 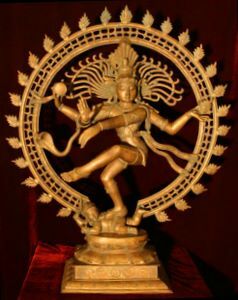 Nataraja, the Lord of Dancers is the cosmic form of Lord Shiva (In Sanskrit, Nata means dance and raja means Lord). The ring of fire and light, which circumscribes the entire figure, identifies the field of the Lord’s cosmic dance encompassing the whole universe. The lotus pedestal on which the Lord rests, locates the universe in the heart or consciousness of each person. 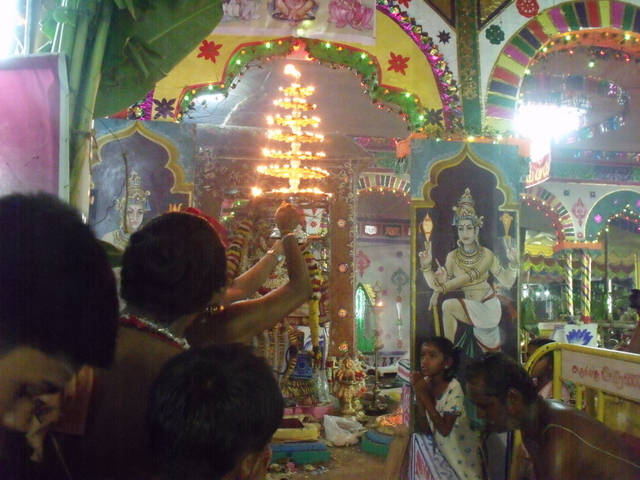 In the temple of Lord Arunachaleswara, the celebration of the Aani Thirumanjanam festival takes place with the following ceremonies: The deities of Lord Nataraja and his consort Goddess Shivakami are worshipped and brought outside of their altar in the main shrine, they are then borne in procession around the first courtyard and then installed amidst great fanfare in another temporary altar inside the thousand-pillared of the temple. 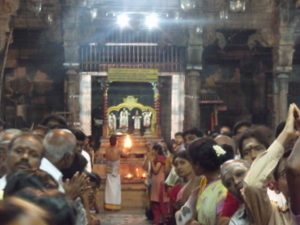 Here the deities are venerated, over the course of the week, with a series of elaborate abhishekams or sacred ablutions followed by karpoora aarathi (waving of camphor flames) and deepaaradhana (waving of lighted lamps). 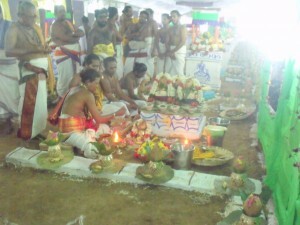 Simultaneously, there takes place another ritual which is called the Arakattu Utsavam. 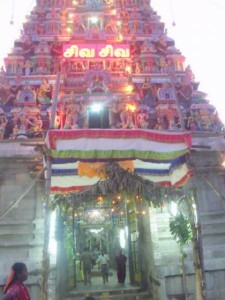 During this ceremony, the three great tamil Saivaite saints namely Appar, Sundarar and Manickavasagar, are worshipped in their altar which is the one directly opposite the altar of Lord Nataraja in the main shrine. 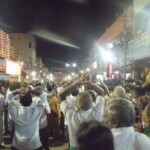 Devotees crane their necks back and forth in order to get darshan of both the ceremonies as they take place at the same time and the priests rush from one altar to the other to do the honours correctly to all the deities. It is quite a sight ! 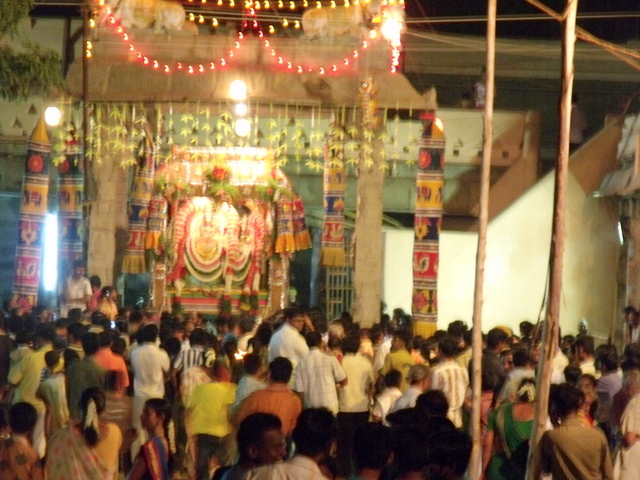 The end of the festival is celebrated at night with a grand Abhishekam and Aarathi to the deities after which they are borne back in procession to their altar inside the main shrine. 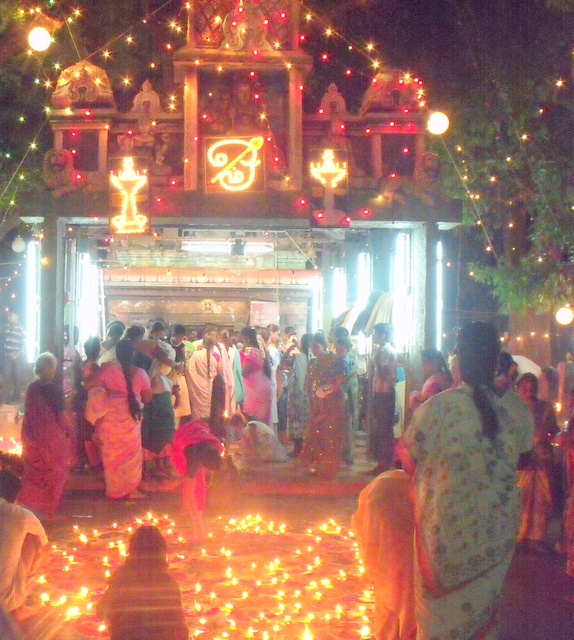 Interestingly, this festival is believed to correspond to the period of ‘between two’ which highlights the transition from day to night, the ‘pradosha’ moment. From this point of view, it would signify the coming of a period of longer nights and shorter days. And thus the end of the hot summer! 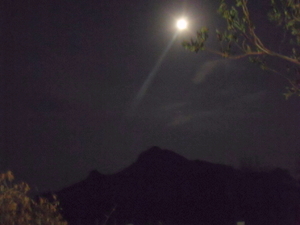 Chithra Poornima is the full moon in the month of Chithirai in conjunction with the Chaitra or Chithra constellation. It is considered as one of the important full moons of the year. The word chithra means brilliant or colourful from which the term chitrakar is derived, meaning painter-artist or magician. 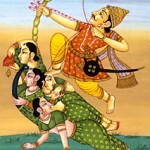 On this full moon night, the legend of Chitragupta is narrated among families. Chitragupta is the Hindu god, who is assigned with the task of keeping a complete record of the good and bad deeds of human beings and after their death, judge them whether they should go to hell or heaven, depending on their actions on earth. 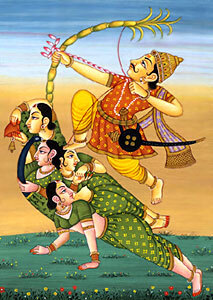 In some beliefs, Chitragupta is the creation of Lord Brahma and the younger brother of the god of death, Yama. According to Hindu mythology, Brahma is the creator of the whole world. He first created sixteen sons from different parts of his body. Then Lord Brahma created his seventeenth son Chitragupta from his belly. Chitragupta is also called `Kayastha` as he was created from the Kaya(body) of Lord Brahma. He is a divine incarnation in human form. Chitragupta has eight sons namely Gorha, Mathura, Bhatnagar, Saxena, Asthana, Srivastava, Ambastha and Karna. The Hindu religion believes in the cycle of life, death and rebirth. It is believed that those who have done misdeeds in this life have to take rebirth after a punishment period in hell to complete their life cycle. The primary duty of Chitragupta is to create a log of the lives of all human beings. After the death of each creature, Chitragupta judges and decides whether they will attain ‘Moksha’ or go to heaven for their good-deeds and get redemption from all worldly troubles or receive punishment for their sins in another life form or in hell. It is a general belief that on this night, any religious act of absolution like bathing in sacred waters or pradakshina around a holy mountain will propitiate Chitragupta who may obliterate the records of one’s bad deeds as a result. 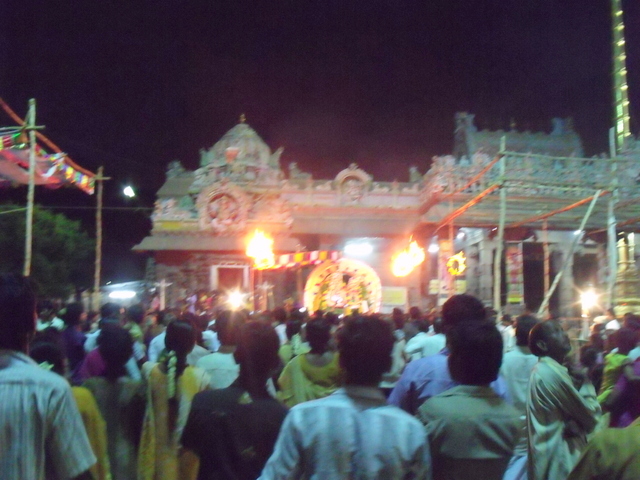 Hence millions come to Tiruvannamalai on this night to do giri pradakshina. 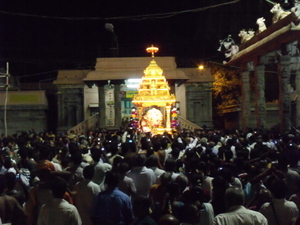 Nandana varusham, the new tamil year was born on Friday, April 13th. The Hindu almanac is divided into two calendar years in India, one is the lunar calendar year (Chandra varusham) and the other is the solar calendar year (Ravi varusham). Tamil Nadu and Kerala are the only regions in India which follow the solar calendar year unlike the other regions which mostly follow the lunar calendar year. The Tamil New year is born in the middle of April which is the first day of the month of Chithirai according to the Tamil calendar and it coincides with the day of the Indian summer equinox. People celebrate the new year like a religious festival and in Tiruvannamalai too, on this day they do giri pradakshina, perform pujas and religious ceremonies in their homes and then go to temples to worship the Lord. 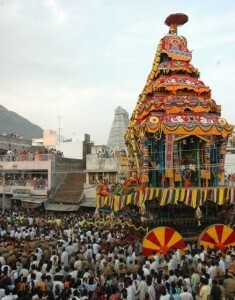 In the big temple of Lord Arunachaleswara, the beautiful golden chariot is taken out in honour of this day and the God and Goddess ride out on procession in all their magnificence and splendour. It is indeed a wondrous sight to see the Gods bedecked with jewels and flowers, seated majestically inside the chariot of pure gold and the air is rent with loud exclamations of wonder and piety as the chariot makes its way, around the vast courtyard of the temple, pulled by hundreds of earnest hands. 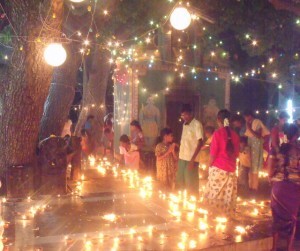 On the other hand, in the village of Adi Annamalai, the Tamil New Year is the day on which they celebrate the spectacular festival of Laksha Deepam or One hundred thousand lamps. 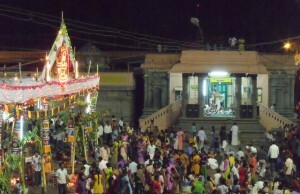 The festival venue is the the Renuka Amman temple which can be seen on the left side of the outer girivalam path right as one crosses the village of Adi Annamalai. 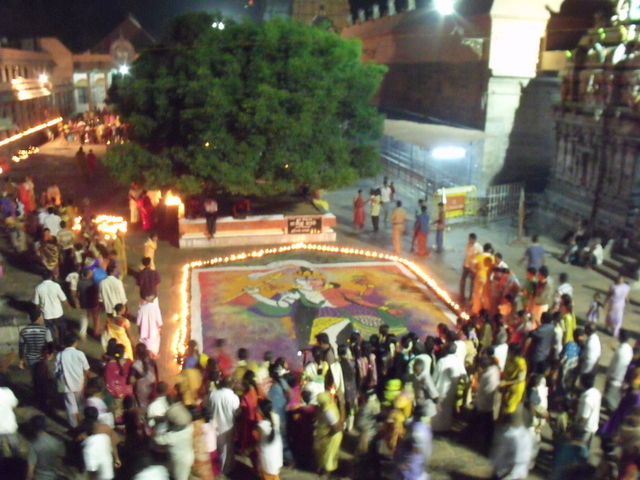 Around sunset, the temple courtyard was already filled with village people who had come to start drawing the Kolams or sacred designs on the ground. Though not much is known about the antecedents of the festival, it seems to be a way of welcoming the new year and also a ritual to propitiate the Goddess so that the summer would not be too hot and that She would send rain from time to time to cool the parched earth and the people. The festival happenings itself are quite simple. 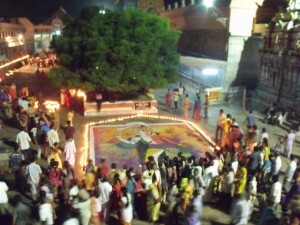 First many beautiful colourful Kolams are drawn all around the temple and then one hundred thousand clay-oil lamps are placed and lit all over the arena. After this, the Goddes is venerated with a huge abhishekam and then finally brought outside in procession through the streets of the village. 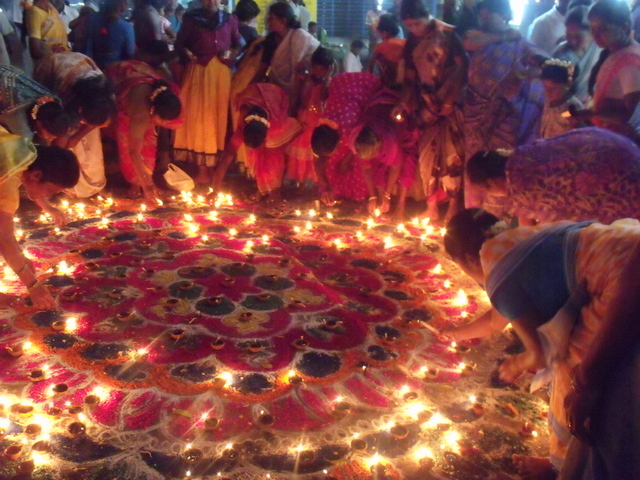 It is an interesting and colourful sight to see the rural folk, both men and women, young and old, all dressed in their festive best and participating so enthusiastically in making the Kolams and arranging and lighting the one hundred thousand oil lamps. 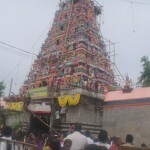 Many women devotees were singing hymns in praise of the Goddess asking Her for blessings and cool rain during the hot summer. 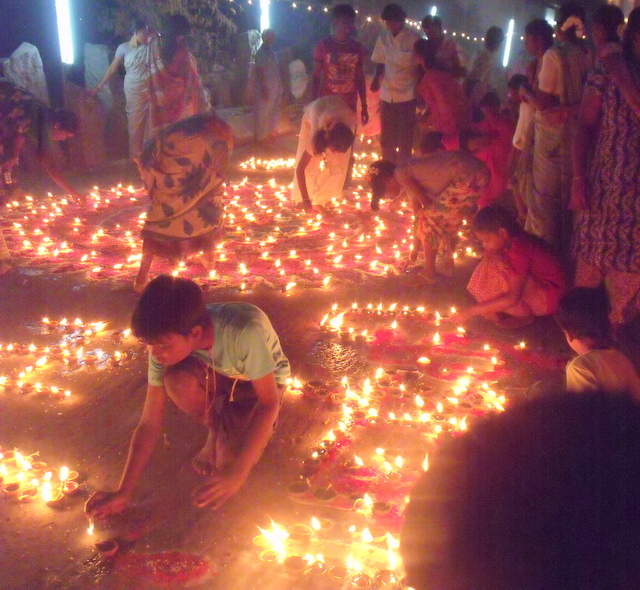 An elaborate Aarthi puja was performed after the lighting of the lamps. Later that night, the Goddess was beautifully decorated and then raised on a pedestal and placed on a wooden palanquin. 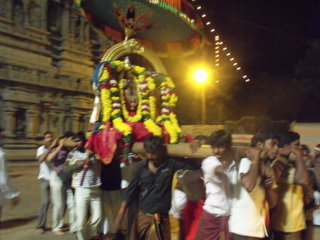 She was then borne in procession by many men around the village of Adi Annamalai where the residents of the village honoured Her, made offerings and worshipped her with devotion ! One fateful spring morning, thousands of years ago, Kama, the God of Love,decided to wield his Cupid´s bow and fire a flowery arrow into the heart of Lord Shiva himself who sat in deep meditation. 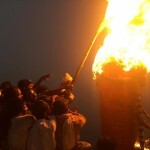 Shiva, thus aroused, becomes furious and burns poor Kama to ashes with the flames of wrath leaping out of his third eye. Much later, Rathi the celestial consort of Kama appeals to Shiva in tearful agony and Shiva moved by her distress resurrects Kama out of the ashes. This event is celebrated as a 10 day festival alternately in the popular quarters of the town of Tiruvannamalai and inside the big temple of Arunachaleswara under the auspices of the Vasantha Utsavam. 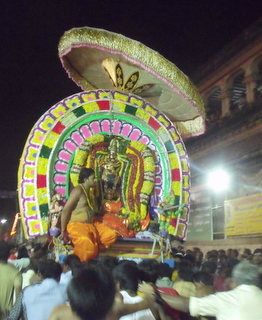 In the town it is celebrated in five minor shrines dedicated to Devi or Subramanya. 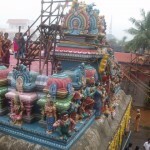 However, in the temple celebration, Kama is resurrected, three or five days after his death. And with this idea, the ashes are collected in a little mound and in the midst of chanting Rathi pours milk on them as is the custom in funerals. 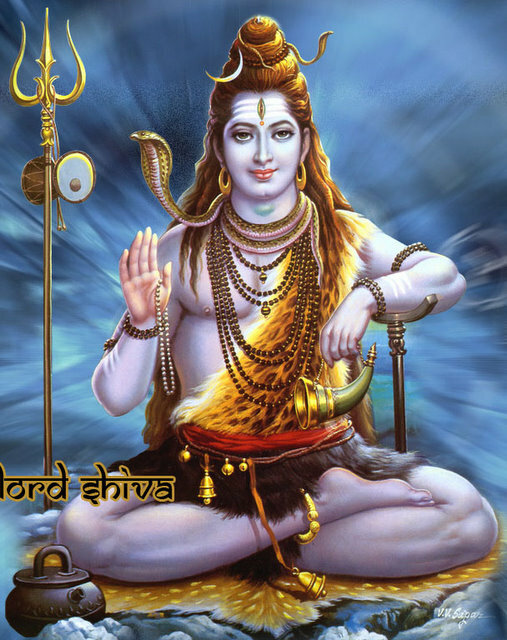 In some cases Shiva also gives a stick to Rathi with which to beat on the ashes thus showing that the Lord has accepted the appeal of the wife and that it is He who thus accords to Kama the right to live again. 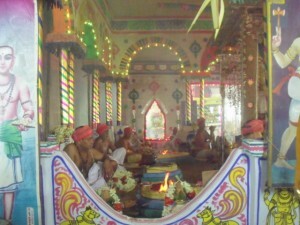 Moreover in the temple, the festival is celebrated just after the vernal equinox which corresponds to midday of the gods day. 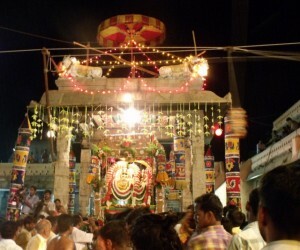 It is notable that the 10th and final day of the festival coincides with the full moon of Chithirai in conjunction with the Chaithra constellation. 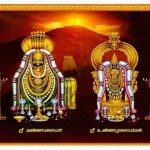 The deity of this festival is Lord Somaskanda, a form of Shiva and Parvathi, usually found in a shrine on the south-western corner of the main temple of Lord Arunachala. 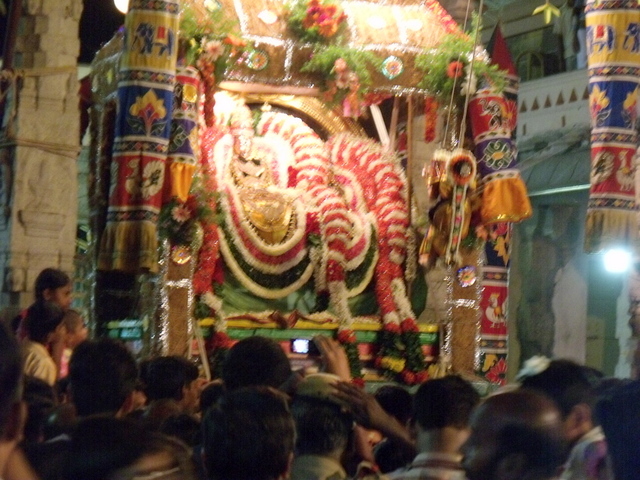 From the first day of the festival upto the ninth, every night around 10 o clock, the gods are brought outside to the third courtyard of the temple, installed in a special palanquin and there ensues an elaborate procession-celebration of the Gods in the form of ten splendid, event-filled tours around the Makila trees lasting till well over midnight. The significance of the “Makila tree” (mimusops elangi) : the tamil verb makil means to enjoy, to desire and the noun makilchi means joy, exultation or ecstasy. 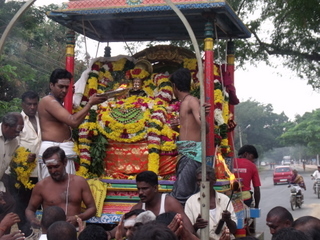 Makiltaran is one of the names of the god Kama. The word makila is often pronounced makuta meaning crown and refers to the coronation of Lord Shiva as the sovereign of the universe. After coming out of his shrine, Somaskanda is installed on the first pandal just in front of the golden flag pole facing the main shrine. 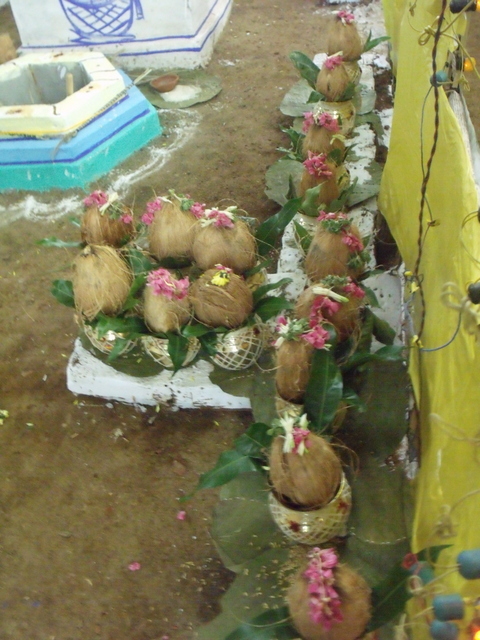 Here the Gods are placed under a lovely canopy of fragrant cooling roots called vilamichaiver vimanam (vilamichai root canopy) hand-made by artisans specially for this occasion, and worshipped with offerings of flowers, diparadhana (waving of lights) and karpuraratti (burning of camphor) with the accompaniment of the temple musicians on their mridangam and nathaswaram. Next the Lord is brought to the second pandal, the panneer mandapam, where he is greeted at first with the lovely fragrance of panneer (rose- water) which is sprinkled copiously from the top. 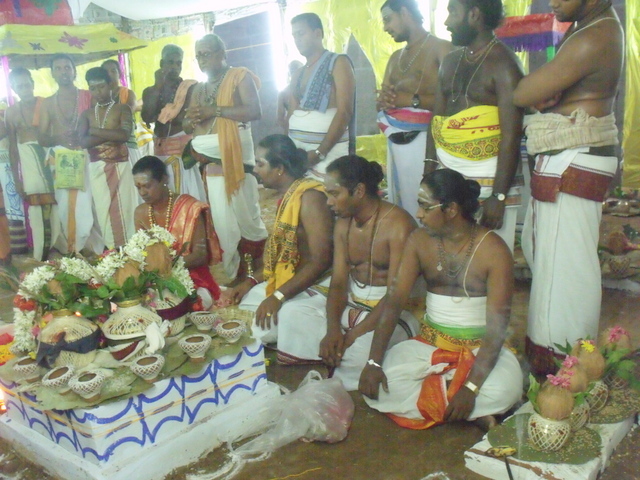 An offering of diparadhana is made and the priest sthanikar climbs on the pedestal and sits at the feet of the Gods. Along with the kalasams Soma and Kama, the Gods are decorated with garlands. And then to the delight of the already excited spectators, the Gods perform a frenzied ritual-dance in front of the mirror placed on the adjacent gallery, with the musicians playing accompaniment with great fervour. 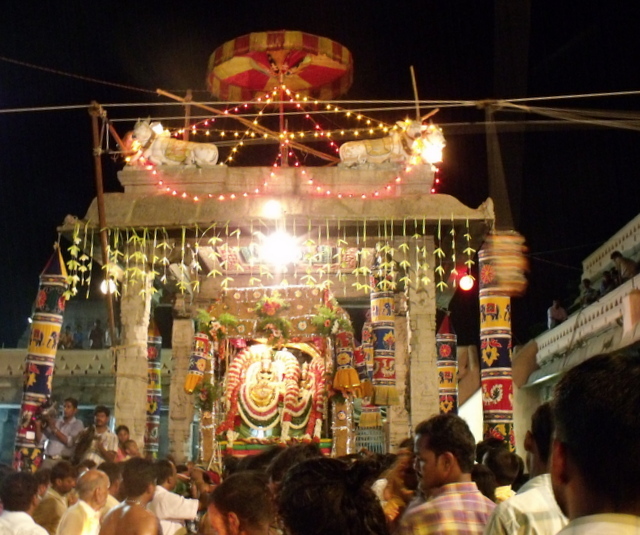 Now the Gods settle down under the panneer mandapam to witness a series of elaborate rituals whose significance should not be lost. 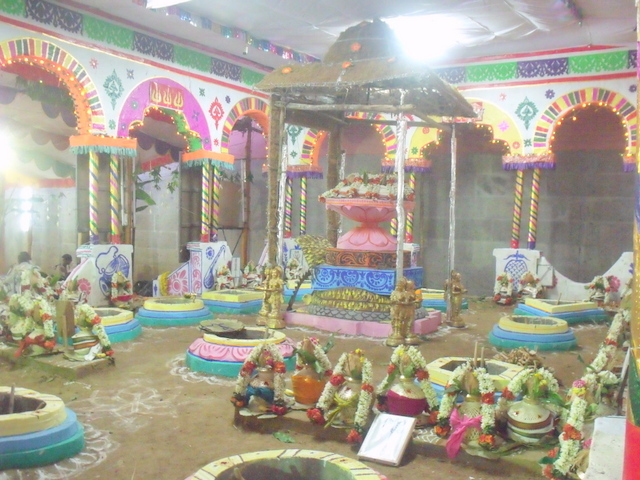 The showering of flowers on the Gods by the Gandharva Kanni (the virgin-nymph) is enacted by a puppet activated by strings attached from the adjacent gallery terrace. In a very beautiful show which is enthusiastically cheered by all the spectators both old and young, the lovely gandharva kanni puppet comes many times, seemingly out of thin air, and showers buckets of rose and jasmine flowers on the Gods. It is indeed a marvellous spectacle! 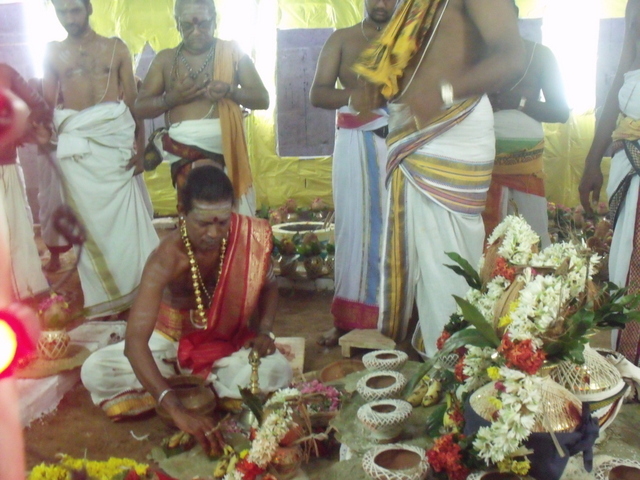 Then a priest pours a pot of water with five vilva leaves in front of the deities and makes an offering of lights. 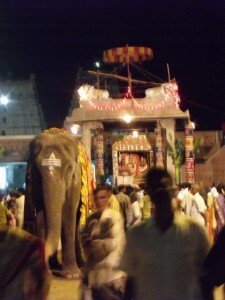 During all this time, the stately temple elephant stands in attendance, donned in its festive robes. 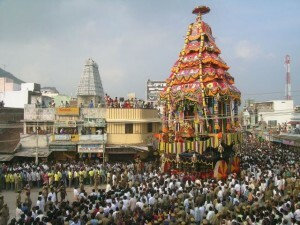 In the past it would gently fan the Gods with a venchamaram (sacred white fan made of peacock feathers and silk). 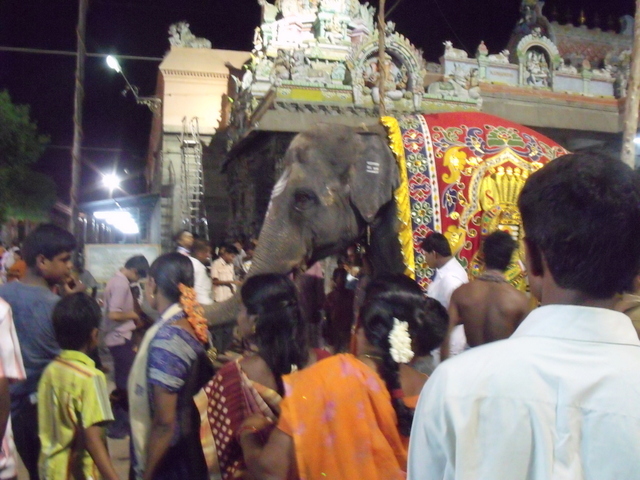 After these rituals, the ten processional rounds take place and the gods are borne on their palanquin ten times around the makila trees enclave led by the elephant and accompanied by the musicians and singers and followed by devotees. 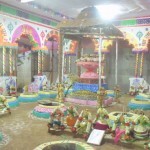 At the completion of each round, the gods dance in front of the mirror and then remain seated under the panneer mandapam where they receive two floral showers by the Gandharva kanni and diparadhana (light) offering. The significance of the Gandharva Kanni (celestial virgin nymph) : The Gandharvas are celestial beings and also musicians. They are the guardians of Soma, the divine nectar of immortality and divine teacher of the Moon who is also called Soma. They are the parents of the first human beings, the brother-sister couple Yama and Yami. The Gandharvas are attributed with a mystical power over women and the right to possess them. They are invoked in traditional hindu marriage ceremonies and in the brahmin tradition, the bride who is to be married is supposed to belong first to Soma, to Gandharva and to Agni before becoming the wife of a human being. A gandharva marriage is a marriage of love (not arranged). The chief of the Gandharvas is Chitraratha. The wives of the gandharva men are usually celestial damsels, apsaras. In the present festival, the appearance of the Gandharva kanni would mean to manifest, in a nubile form, the expression of desire and the virtue of union as well as the other elements which are associated here-in (flowers, fragrance, music). The death and resurrection of Kama represent the spiritual truth of how after the ego is destroyed, one is reborn as pure eternal Being. The fact that the flames from the third eye of Shiva burn Kama signifies that the third eye of Jnana (knowledge) in one’s heart must be opened in order for the ego (ignorance) to be destroyed for no darkness can prevail when the light of knowledge shines ! 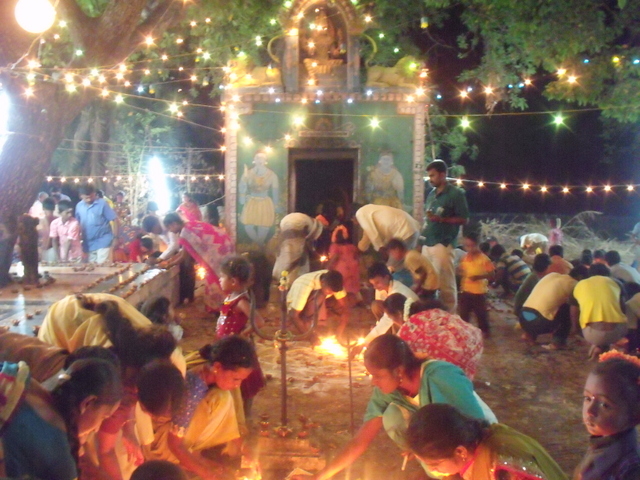 The highly revered and most auspicious night of Maasi Magham occurs when the Magham constellation, according to vedic astronomy, appears on the full moon night of the tamil month of Maasi (mid-feb to mid-march). Magham is one among the 27 nakshatras in the vedic astrological chart. It is believed that Maasi Magham is an ideal time for spiritual purification.The full moon of Maasi Magham is one of the most powerful full moons of the year, since the moon aligns with Magha which is the birth constellation of great kings and rulers. It signifies the descent of divine beings to the earth. It combines the benefits of abundance and prosperity and is also the most appropriate time to destroy our ego and surrender ourselves to the feet of the Divine. 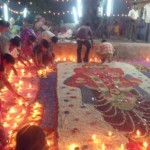 The festival of Maasi Magham is celebrated generally by taking a dip in sacred waters like rivers or oceans for it is believed that the energy of the holy Ganga flows through all sacred waters at this time. In general Maasi Magham is believed to pave our way towards prosperity and a trouble-free, successful and wealthy life of honour! 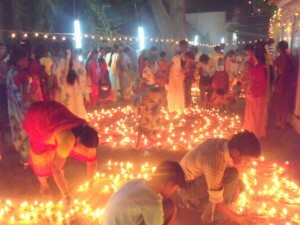 It is also believed to be a great occasion to get rid of the negative effects of karma. 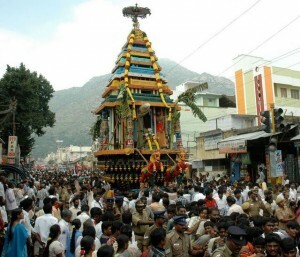 In Tiruvannamalai, this is the day on which Lord Shiva and Goddess Parvathi go to perform the last funeral rites of the erstwhile king Vallala Maharaja. The sacred bath in this case is taken in a little river ‘Sonadi’ which flows through the region. 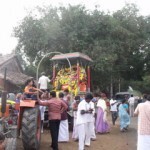 In the morning, the deities of the God and Goddess and that of the Astra deva or the Trident weapon of Shiva are all carried out in procession to the village of Pallikondapattu, about five kms to the east. They are taken to the banks of the river and installed ceremoniously on a pavilion-shrine facing the water. Here awaits a group of fifty people claiming to be descendants of the aforesaid king. A puja is offered to the idol of the Astra deva and the deity is bathed in the waters. 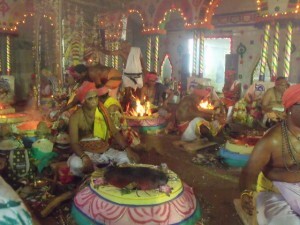 The devotees also take a holy dip after this. The Trident is then anointed and decorated with silk and flowers and camphor is burnt in offering. In the afternoon, the deities of Shiva and Parvathi are turned to face the mountain. In front, the priests place two pots representing the divine couple and 8 pots representing the Vidyeshwaras and then kindle a small sacrificial fire in the centre. 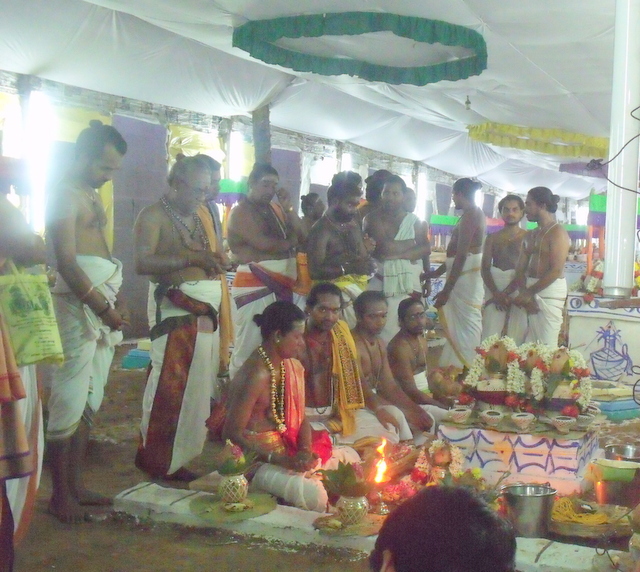 After this a grand puja involving many abhishekams and aarathi are performed to all the deities. 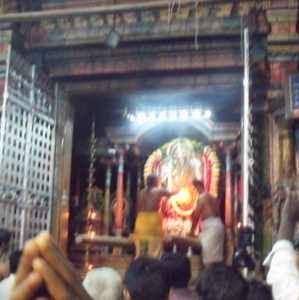 The next day the ceremony which consists of tying a turban around the head of the son of the deceased takes place inside the big temple.The name of this ceremony is ‘thalaikattu’ but in this case since it concerns Shiva, it is called ‘makutabhisheka’ (consecration of crowning). In the absence of a human king in Tiruvannamalai (except during the brief Hoysala period) the sovereignty over this kingdom is thus transferred to Lord Shiva himself ! The great night of Shiva or Maha Shivarathri as it is popularly called, is a very important and spiritually significant festival that commemorates the legend of Brahma, Vishnu and all the other gods bowing to the supremacy of Lord Shiva who manifests as the infinite column of effulgence, after having earlier humbled the pride of Brahma and Vishnu. At their request, Lord Arunachala out of compassion, takes the form of a Linga and this is known as Lingodbhavamurthy. 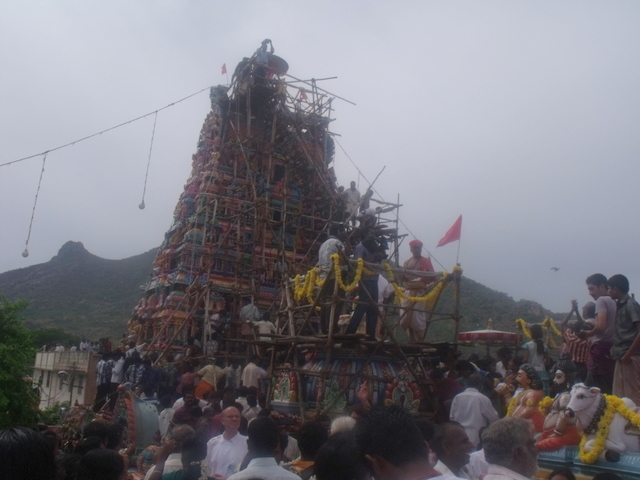 Tiruvannamalai is one of the Pancha Bhootha Sthalams of Lord Shiva where the Lord manifests Himself as the Agni or Fire element. Therefore Maha Shivarathri has a special significance here. 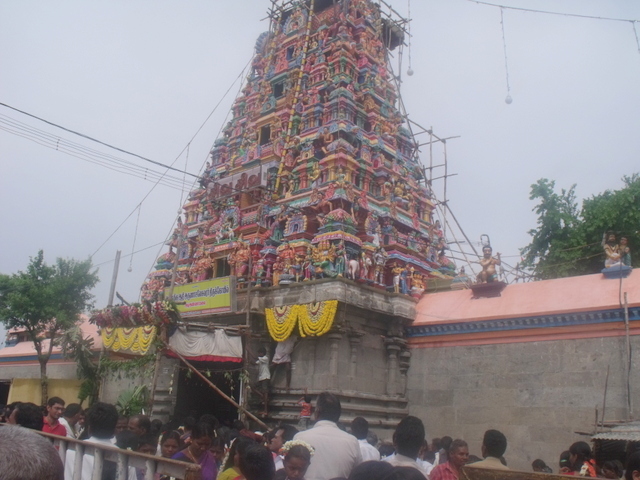 The Arunachaleswara temple gates open at around 2 in the morning on that day and after the initial abhishekam and puja, laksharchana (chanting the Lord’s name one hundred thousand times) begins and continues till late afternoon. The temple is open the whole night with pujas at three-hourly intervals, the first of which is held at six in the evening. This year too, the temple was filled with devotees praising and worshipping Lord Shiva. 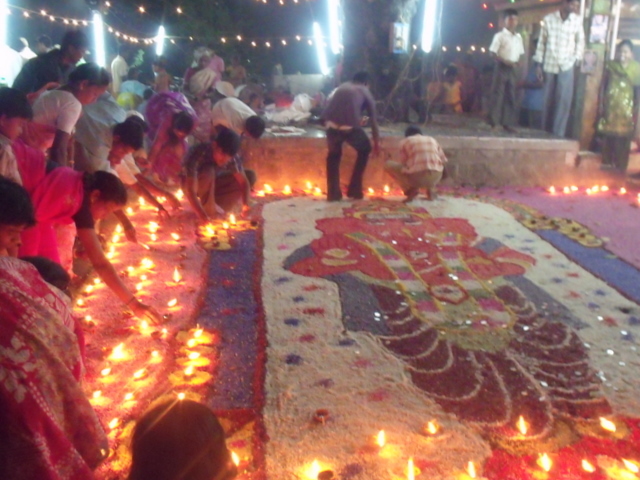 Many were engaged in making enormous colourful designs (kolams) on the floors depicting various forms of Shiva. Thousands and thousands of fire lamps were lit everywhere. 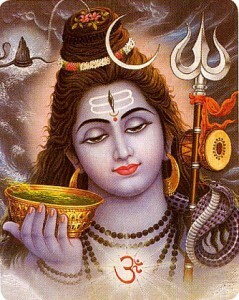 Every stone vibrated with the tremendous Shiva energy which was descending like an avalanche from the Heavens. 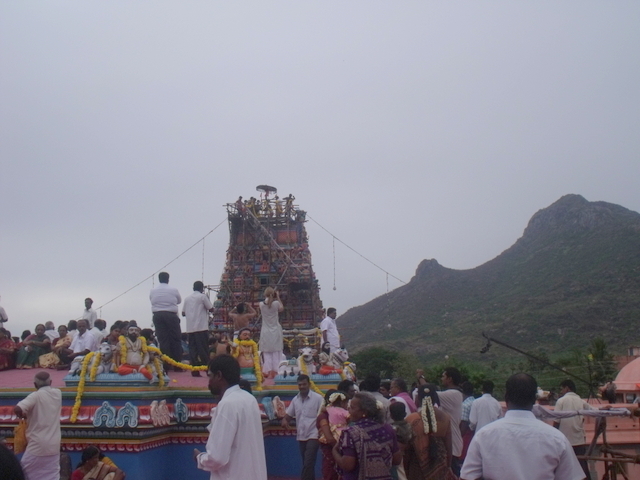 Giri Pradakshina was performed by many all through the night and the Hill of Arunachala radiated with a Divine energy which seemed to engulf everyone and everything. 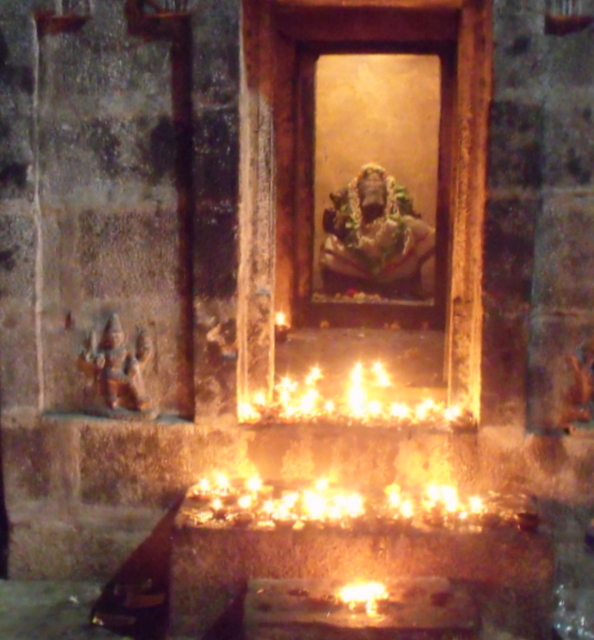 The true meaning of Maha Shivarathri was expounded by Sri Ramana Maharshi on a Shivarathri night many years ago. When one of the sadhus sitting in the Maharshi’s presence requested him to explain Adi Shankara’s Dakshinamurthi stotra (hymn), He said, “Yes, sit down”. Devotees eagerly awaited to listen to His exposition, but Bhagavan maintained his usual posture and a steady silence. The clock ticked by and hours passed. There was a spellbound silence. Everyone present was deeply absorbed within himself. With the break of dawn people began to regain their body consciousness. Bhagavan graciously asked the questioner whether he understood now the significance of the hymn. the sadhu and the others nodded and made their grateful obeisance to the Master. Thus the real significance of Shivarathri as demonstrated by Bhagavan Ramana was that, whatever the body might be doing on that day, the mind must merge into its source.